When Lorraine Potocki, M.D., attended medical school in the 1980s she didn’t have exposure to a genetics class. Dr. Potocki, a professor at Houston, TX-based Baylor College of Medicine’s department of Molecular and Human Genetics, wasn’t even aware that there were training programs in genetics until her residency was well underway. And she didn’t know there was such a thing as clinical geneticists. Fast forward to 2014: That’s when the first class of medical students graduated from Houston, TX- based Baylor College of Medicine, with a concentration in a genetics track curriculum that Dr. Potocki co-founded with Shweta Dhar, M.D., just a few years ago. 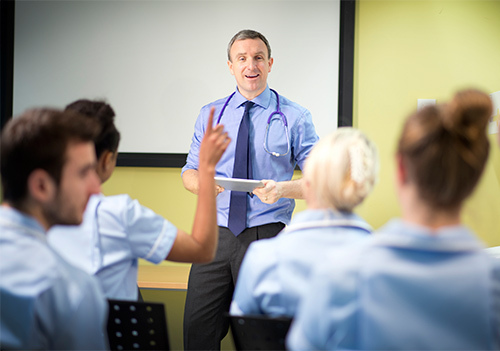 In addition to three preclinical electives which are available to any med student, the track includes: a Journal Club course for students to discuss key articles in genetics and genomics; an Exome Sign Out Round, where the department meets monthly to discuss patient presentations and whole exome sequencing results from its laboratory; Patients as Teacher program; and a scholarly project which enables student to develop a genetics course. Albeit a small class, comprised of 15 students, Dr. Potocki believes that offering a genetics track to Baylor’s 180 medical students is essential. Make no mistake. The new crop of students nationwide will need much more than just a basic understanding of human genetics for optimal patient care, thanks to the remarkable progress in the field of genetics and genomics, notably the Human Genome Project and the development of genomic-based technologies. In 1967, Duke University Medical School, Durham, NC launched The Duke University Program in Genetics and Genomics (UPGG), an umbrella graduate training program that spans several basic science and clinical departments and bridges the Medical Center and the College of Arts and Sciences. The UPGG currently consists of over 100 faculty and adjunct faculty and more than 75 students. In 1981, Harvard University established the department of genetics at the Medical School. Advances in human genetics had already occurred at its affiliated institutes, including Children’s Hospital and the Massachusetts General Hospital. In its sister faculty in Cambridge, molecular genetics had already produced dramatic discoveries that established the foundation of the science. Dr. Mefford went on to say that incorporating genetics and genomics into the medical school curriculum has never been more important. “Genetic testing is available for disorders across all specialties and all stages of life (prenatal to pediatric to adult). Physicians need to be aware of when and how to send testing and, at the very least, when and to whom to refer their patients for the most appropriate testing and interpretation of results,” said Dr. Mefford. In the fall of 2009, Johns Hopkins School of Medicine fully implemented its Genes to Society curriculum. According to the Johns Hopkins Gazette, the curriculum was nearly six years in the making. The curriculum centers on advances in understanding of the human genome. The changes, some of which have already been integrated into the academic schedule, are grounded in the Human Genome Project and the concepts of human variability, risk and the ability to alter disease presentation and outcomes. Genes to Society also incorporates knowledge in the social and behavioral sciences, as well as public health and policy content, with an aim toward improving societal health outcomes. In September 2015, Duke University’s School of Medicine created the Center for Statistical Genetics and Genomics. The center, led by Andrew Allen, Ph.D., professor of biostatistics and bioinformatics, will bring together quantitatively oriented scientists from various disciplines on the Duke campus to address the computational and statistical challenges associated with efforts to use genomics to improve patient care. The goal of the genetics course in the Foundation Block is to train the student in principles of inheritance, and provide an introduction to molecular genetics and cytogenetics. The course then provides students with a broad exposure to disease areas where genetics is essential for understanding such disorders, and culminates with an overview of emerging themes in genomic medicine. To illustrate key issues in medical genetics, students are taught a set of cases from clinical practice in small groups, including diseases such as cystic fibrosis and a developmental disorder diagnosed by genomic sequencing. If students wish to acquire further training in genetics, they are offered a clerkship in clinical genetics where they will participate in the care of patients. This clerkship experience will include cases where genomic sequencing is being used to make diagnoses. Students also have the option of taking a research year where they can participate in biomedical research utilizing emerging genomics techniques. To be sure, a growing number of large medical school have indeed stepped up to the plate, but adoption of a genetics track, or advanced genetics and genomics courses, is still absent from many med schools’ curriculum. Recent numbers are hard to come by, but in an Education Report, which appeared in Genetics in Medicine in January 2012, Dhar and a team of researchers noted that over the past several decades many studies have been published demonstrating the deficiency of genetics in the medical school curriculum. Dhar pointed to a study by Hutner et al., which showed that a major proportion of practicing physicians rely upon their undergraduate and medical education in genetics, and most doctors feel less confident about genetic counseling and testing. Michael Dougherty, director of education at the American Society of Human Genetics (ASHG), believes that there’s little recent evidence to suggest that the amount of genetics in the med school curriculum has increased “which means that less than half of medical schools incorporate any genetics in the third and fourth years of med school (i.e., the clinical years). Roughly three-fourths teach medical genetics in the basic science first year,” said Dougherty. ASHG’s executive vice president Joseph McInerney said a recent study showed that medical students who had demonstrated mastery of genetics concepts in their basic science courses could not then apply those concepts during their clinical rotations. “This paper highlights the problem with teaching genetics only in the basic-science years: once the students move into their clinical rotations, there are too few preceptors trained in genetics to help point out and elaborate for students the genetic messages inherent in the clinical cases they encounter,” he said. Christopher “Cody” Miller, who is a first year med student at Baylor opted to pursue the genetics track although he says he that he isn’t interested in becoming a clinical geneticist. “I believe that genetics is intrinsic to all areas of medicine. The advent of personalized medicine and all of the research showing that chronic diseases, such as hypertension and diabetes, and all genetic risk factors aren’t necessarily discrete, heredity things, but may predispose you, shows that genetics will play a larger role in medicine,” said Miller. Miller said he is especially touched by learning about the genetic conditions of the patients he has met in the track’s Patients as Teachers program. Mark Lempert is a patient who participates in this program. After being diagnosed with colon cancer, Lempert was undergoing chemotherapy when his doctor did genetic testing and found that he had a genetic predisposition to his disease. Lempert, who had his colon removed, said that the students are very interested in hearing his story, learning about his genetic condition, and how his diagnosis affects his family’s decision to get tested or not. So, with all of the advantages for students and patients that comes with courses in genetics, what are the roadblocks preventing medical schools from jumping on the genetics bandwagon? One of the barriers facing medical schools is the lack of a huge infrastructure that is necessary for the type of technology that genetics sequencing requires. “It’s difficult for places to do this. It’s not a simple thing. It’s not just, okay, you need some sequencing. You have to build an entire superstructure for this technology. You can’t just have a machine that generates data. You need people to analyze data, people to make libraries, you need storage, and you have to have programs that surround it,” said Dr. Smith. Emphasizing that the technology to sequence genes was born in 2006, but that it has only been used in the clinic setting for a few years, Dr. Smith said a revolution not seen since the development of the transistor, is rapidly occurring not only in med schools, but pharmacy schools. Dubbing it “a pharmacogenomics revolution,” Dr. Smith sees a need for pharmacy schools to develop a genetics curriculum too. “Now they are measuring some of the P450 enzymes responsible for metabolizing various things. If you are a fast metabolizer it means you have to use more of a drug, if you are a slow metabolizer, less, so pharmacogenomics is becoming very critical in determining how much of a drug you give someone and it is transforming pharmacy,” said Dr. Smith. Pointing out that the Mayo Clinic has a whole series of molecular genetic tests, and over the past decade there has been an explosion from just a few tests to hundreds, Dr. Smith explained that access to a highly competent staff capable of generating and analyzing data is paramount to success in setting up a genetics curriculum. “It’s just the tip of the iceberg. All of those tests, in the next two years, will transition from Sanger (classical) sequencing to next-gen sequencing. With next-gen sequencing you are sequencing, 10, 50, or 100 or more genes together,” said Dr. Smith. Having next-gen sequencing also entails creation of a plethora of libraries, and Dr. Smith argues that someone has to be generating the libraries where they are capturing whatever it is you want to sequence and then produce the library and get it ready for the sequencing machine. Another hurdle med schools face when trying to delve into sequencing technology is the immense cost for the sequencing machines, especially when many of them become obsolete in just a few years. Add to this the fact that there aren’t any reimbursement codes in place, and it’s no wonder that some schools are hesitant to set up a genomics program. Having a strong bioinformatics department, which includes a very strong program in research, statistics, and bioinformatics analysis, is one which can serve students well, says Dr. Smith.